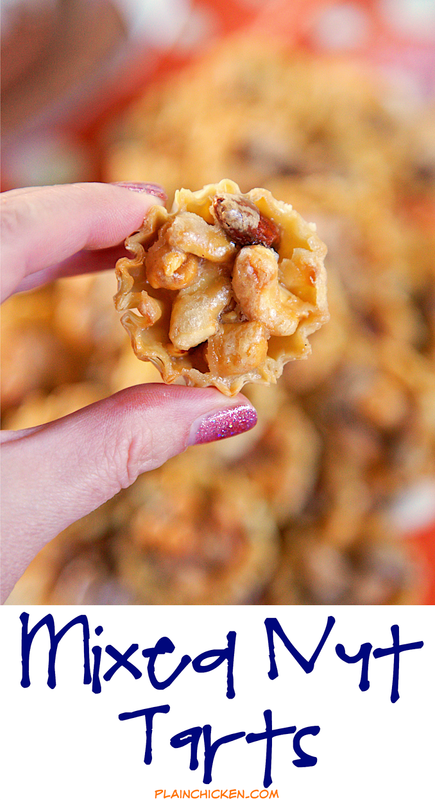 Mixed Nut Tarts - honey roasted mixed nuts tossed in a homemade caramel sauce and baked in mini phyllo shells. Ready in 15 minutes! Great for parties and your holiday table! Double the recipe - they were gone in a flash!! Can make up to 2 days in advance. 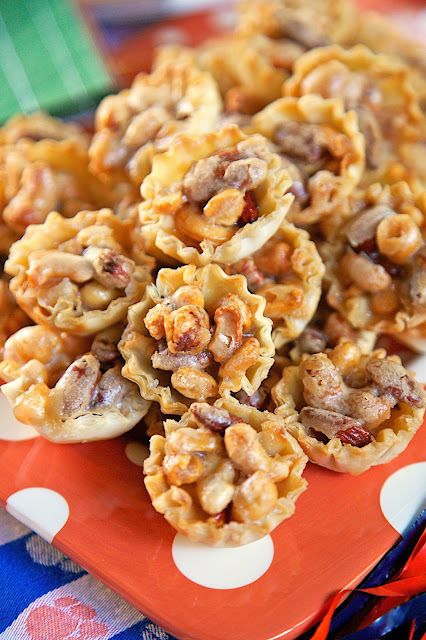 Stop what you are doing and go the store to buy the ingredients to make these Mixed Nut Tarts. They are SO good! I seriously could not stop eating them! This recipe makes 45 tarts per batch. They are super simple to make. They only take about 10 minutes and they are ready for the oven. 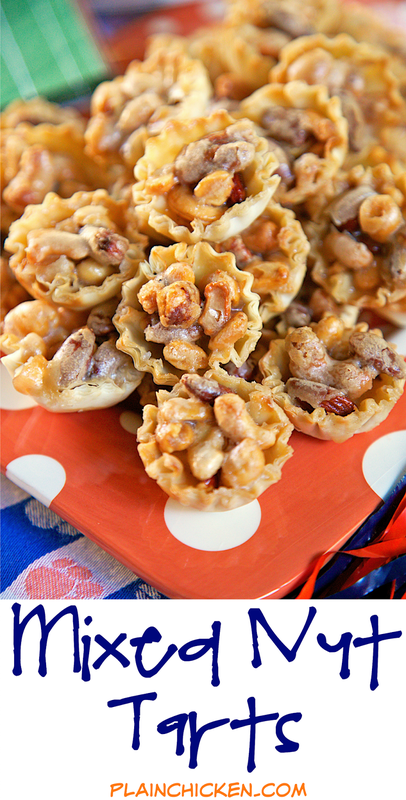 Not only are these great for tailgating, they would be perfect for Thanksgiving! I am definitely planning on serving these at our Thanksgiving dinner later this month. I like to eat lots of little bites of dessert instead of one big slice of something. I don't like to commit to just one dessert! They also keep with my easy holiday theme - quick and easy! I need everything to be easy to prep and quick and easy clean up with my InSinkErator Evolution Excel Garbage Disposal! Stress free holiday for the win! Preheat oven to 350ºF. Place phyllo shells on parchment lined baking sheet. In a large saucepan, combine butter, brown sugar, sugar, and heavy cream. Stir over high heat until blended and starting to boil. Reduce heat to medium and boil gently, stirring often, for 2 minutes. Remove from heat. 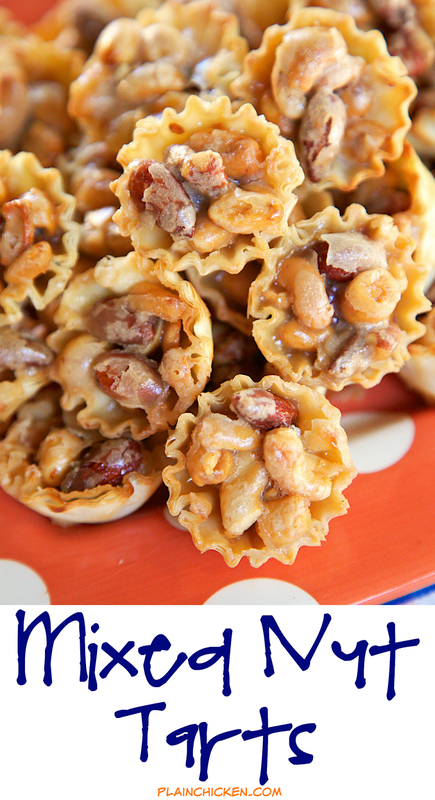 Carefully stir in vanilla and mixed nuts. Allow to cool slightly. 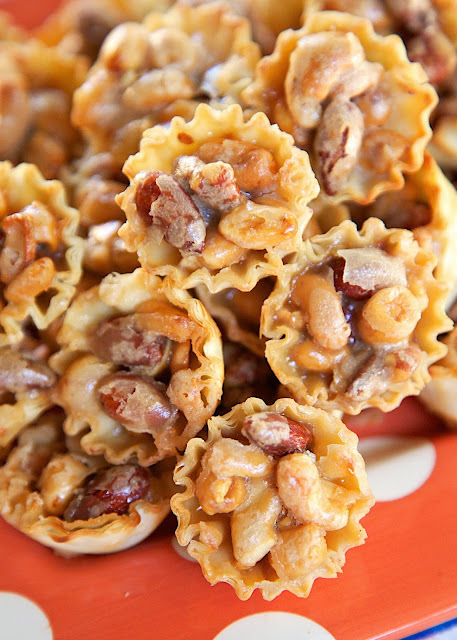 Divide filling among phyllo shells. Bake for 12-15 minutes. Let cool before serving. Yes, you're right, I need to run to the store and make these asap! Thanks Stephanie! They are dangerously delicious! Enjoy! Sorry you don't believe me! I promise they are good. I made them at a cooking demo the other night and everyone loved them. A couple of people made them and posted on Facebook that they were good. These look wonderful. Any idea if they can be frozen? I haven't frozen them, so I'm not sure. what is the best way to store them after they are baked? A ziplock bag or gladware container work great. Would these work for a bake sale? I'm not sure how expensive the shells are. Would they be too expensive to sell well so that we don't lose money? I'm definitely making them for the holidays either way! The shells are about $2/box of 15.